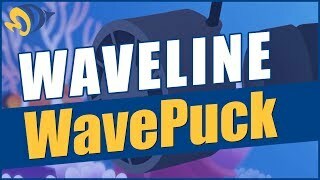 The new Waveline WavePuck is a fully controllable flow pump that moves up to 3000gph and consumes no more than 30 watts of power in the process. The broad flow water movement will encourage coral growth instead of blasting it away with harmful "hot spots" associated with other wave pumps. 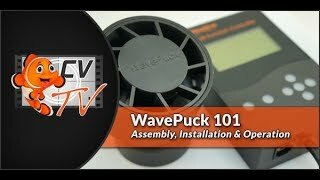 With it`s unique articulating magnetic mount, the WavePuck can easily get the flow precisely where you need it. The rear of the WavePuck has a convex rounded shape which fits neatly into a concave mounting magnet, allowing the pump assembly to gyrate in any direction. The WavePucks`s low-profile magnetic mount offers a 25 degree range of motion and the entire pump is capable of rotating 360 degrees! The WavePuck Multi-Function Controller allows you to create pulsing or surge effects with its easy to set waveline mode as well as the expected feed mode. Simply set your desired max power/flow setting and its on and off power cycles. You can also set the pump run time to facilitate night mode by shutting the pump down till the run time resumes. 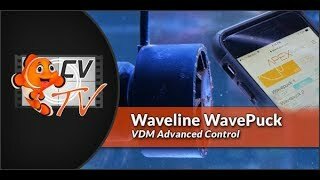 For all those that desire more control, the WavePuck can link up to most 3rd party controllers by using an available 0-10 volt port. This makes the pump very versatile and almost universally compatible with most system controllers including the APEX by Neptune Systems or the Reef Angel among others. H2O Systems Inc. is a professional aquatic equipment developer and manufacturer based in Canada. Our product developing team has over 30 years of marine aquarium husbandry experience. We focus on providing innovative aquatic products for all facets of the aquarium hobby.